Pass/fail tests used to define whether or not a feature is functional, usually developed in parallel to the defining of a feature. These tests may be written in plain English by the customer or product owner (“The user clicks , the session is reset, and the user is redirected to the homepage.”) Ideally, an acceptance test is subsequently automated by the developer so that it can easily run on all iterations of the software, ensuring that the accepted feature has not been broken by newer development. The use of acceptance tests in subsequent iterations is also known as regression testing. Acceptance testing is a key feature of test-driven development (TDD). In Scrum: Scrum does not specify testing methods, and testing is not a part of the Scrum framework. This said, most Scrum teams test, and within the Scrum framework, the product owner would be the appropriate person to define acceptance tests. The concept of acceptance testing exists in other engineering disciplines than software development, and is usually referred to as black-box testing. Although acceptance testing is common across many Agile disciplines, the term derives from XP. According to C2.com, acceptance tests were first referred to as functional tests, because they test whether or not a feature works. Kent Beck, a primary mover behind TDD, proposed the change in terminology in April 2000. An umbrella term for iterative, incremental software development methodologies. Agile methodologies include Extreme Programming (XP), Scrum, Crystal, Dynamic Systems Development Method (DSDM), Lean, and Feature-Driven Development (FDD). Agile methodologies arose in opposition to the traditional, phase-driven “Waterfall” development method, which emphasizes top-down project management, “big design up front,” silos for architecture and design, coding, and testing, and extensive documentation. Agile methodologies share an emphasis on small teams delivering small increments of working software with great frequency while working in close collaboration with the customer and adapting to changing requirements. An ever-evolving list of product requirements, prioritized by the customer (or customer representative), that conveys to an Agile team which features to implement first. Agile projects typically employ a top level backlog, known as a product backlog or release backlog, and each Agile team working on a project typically creates a backlog for each development iteration, known as an iteration backlog or sprint backlog. 1) The process of adding new user stories to the backlog, re-prioritizing existing stories as needed, creating estimates for previously un-estimated stories, and decomposing large stories into smaller stories or tasks. Backlog grooming is both an ongoing process and the name for a meeting (see definition 2). 2) A meeting or ceremony that occurs regularly within a team’s iteration cycle. Scrum Alliance founder Ken Schwaber recommends that teams allocate 5% of their time to revisiting and tending to the backlog. 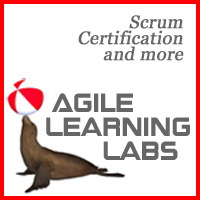 Backlog grooming is the term favored by the Scrum Alliance, although Scrum co-founder Jeff McKenna and Australian CST Kane Mar prefer to call this ceremony Story Time. Plots units of work that remain to accomplish (Y axis) against units of time (X axis). 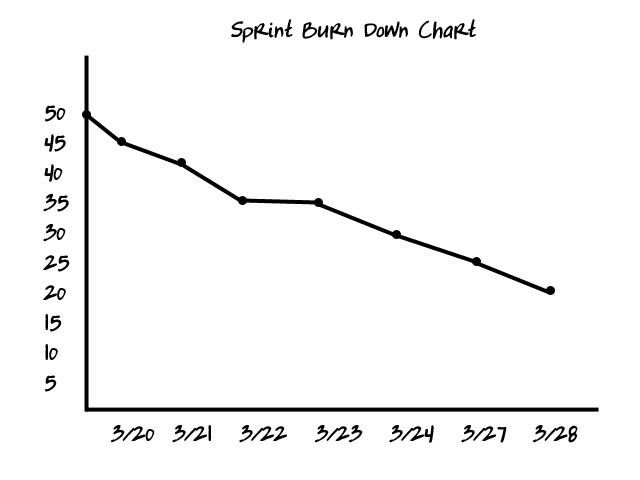 In Scrum, the Burn Down Chart is a key artifact. 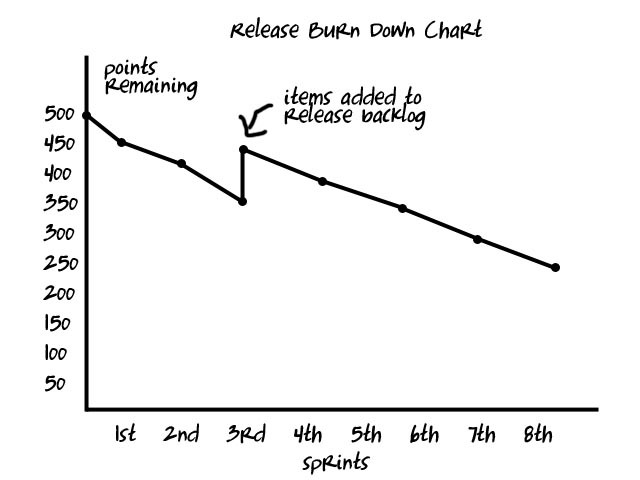 The units of work that appear on a Burn Down Chart are derived from the Release Backlog. During the process of Backlog Grooming they have been assigned an estimated point value. The trend line on a Release Burn Down Chart will generally trend downward, however, if new items are added to the Release Backlog, then the total points remaining may go up. 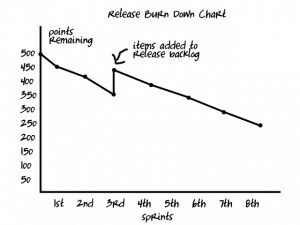 The Release Burn Down Chart is the primary tool a team has for visualizing their velocity, the average number of points they accomplish during an iteration. 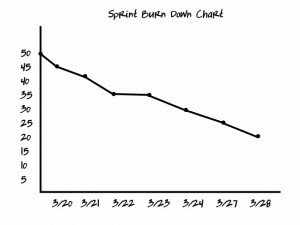 The initial point value of work remaining in a Sprint Burn Down chart derives from the work the team commits to accomplish during the Sprint. Work remaining is generally graphed daily. The number of points the team undertakes is based on their established team velocity, i.e., the number of points they routinely complete. In Scrum, no new work may be added once a sprint has begun, so the trend line will never rise. In Extreme Programming, work may be added during a sprint, so the trend line may rise. A Team’s universally agreed-upon criteria for what makes a unit of work “potentially shippable.” This checklist of steps that must be completed for each unit of work (e.g., task or user story) may include items like “documentation created,” “code review completed,” “all tests created and passing,” etc. The Definition of Done usually takes the form of an information radiator, being posted prominently in the team’s work space. A well-crafted Definition of Done may prevent the accumulation of technical debt that naturally arises when team members define done loosely and colloquially. In Extreme Programming, the Definition of Done may be referred to as Task Complete Definition, a Punch List, or a Binary Milestone.